Archie Comics were first introduced in the early '40s. 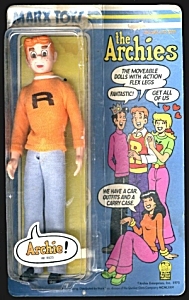 After the success of the cartoon and the "band" in the '70s, the gang from Riverdale was so popular that at least a half-dozen manufacturers released Archie doll sets over the next 30 years. Whitman, famous for it's books and paper dolls, produced a paper doll tribute to the Archies in 1969. This is probably the hardest series to find in mint condition due to the fraility of the figures and their accessories. In 1975, Marx released it's line of Archie figures. The dolls were 8-inches tall with rude articulation. Archie and Jughead had molded hair while Betty and Veronica had rooted hair. All of the figures came dressed but you could also buy different clothing sets on cards. The hardest pieces to find from this series are the Jalopy and the vinyl Carrying Case. In 1977, Mattel's Archie dolls were in stores. These were about 6-inches tall and made of cloth, very similar to the Honey Hill Bunch line. Mattel also made Sabrina the Witch and a Jalopy. The Presents company's (a division of Hamilton Gifts) 1987 interpretation of the gang are very popular. The dolls are cloth and stand about 18-inches tall. Like the Marx line, the males have molded-hair while the female's hair is rooted. This series included the often-overlooked Reggie. McDonalds offered a premium of the Lil' Archies, including lil' Moose, in small cars in 1988. Burger King offered a similar premium of 4 Archie figures in vintage cars in 1991. Jesco joined the ranks in 1989 with it's line of 6-inch bendys. Reggie once again finds his way back into 3D! Tom Lowe's Playing Mantis will be releasing a Veronica and Betty doll in 2000. If you are an Archies fan, there are many more collectibles available than just figures. A visit to your favorite search engine will produce a wealth of glasses, posters, stickers, lunch boxes, beanies, cereal premiums, tattoos, pillows, records, record cases and more. Everything Archie.